I LOOOOOVE cheesecake! Thank goodness that even as a vegan, we don’t have to miss out on this delicious dessert. These vegan cheesecake cups are inspired by my Baked NY Style Cheesecake recipe. It’s a pretty simple recipe to whip up and the perfect handheld dessert for parties. I chose to turn half of my batch into a chocolate cookies and cream cheesecake and the other half into a strawberry shortcake version. Both are equally good and satisfy every taste-bud. The part that makes these cups extra simple to make is their cookie bottom crust. I happened to find a sandwich cookies brand called Tasty. Their cookies are vegan, organic, without high fructose corn syrup or trans fats or hydrogenated oils, kosher, and palm oil free. You could always use Oreo cookies as well, if no other vegan brand is available, as Oreo cookies are vegan too. However, I always try to support vegan brands whenever I spot them in stores. Additionally, this recipe is made even tastier with some of my Salted Caramel Sauce. I had made a batch for this blog and my youtube channel and I thought this was the perfect way to use some of it up. It was perfection over my chocolaty cheesecake cups! These handheld mini vegan cheesecake cups are a fun dessert that'll definitely be a crowd pleaser. First, preheat your oven to 350 F.
Take a cupcake or muffin tin and line it with paper cupcake liners. Lightly coat the inside of your liners with cooking oil spray. Add a whole chocolate sandwich cookie to half of your liners and a whole vanilla sandwich cookie to the other half. The cookies will be the bottom crust of your cheesecakes. Then fill each liner with cheesecake filling going about half way up the liner. Next, crush about 4 chocolate sandwich cookies in a plastic bag until finely crumbled. Add about 1/2 tsp of this crumbled batch of cookies to the liners with chocolate cookie bottoms. Then, add about 1/4 tsp dollop of strawberry preserve to the center of each liner with a vanilla cookie bottom. Now, cover each liner with the remainder of your cheesecake batter, filling each cup up to slightly below the top of the liner. Set the cups to bake for 30 min, until they begin to turn golden over the top. Once done baking, allow cups to cool completely. Carefully remove their paper liners and set them on a serving tray. 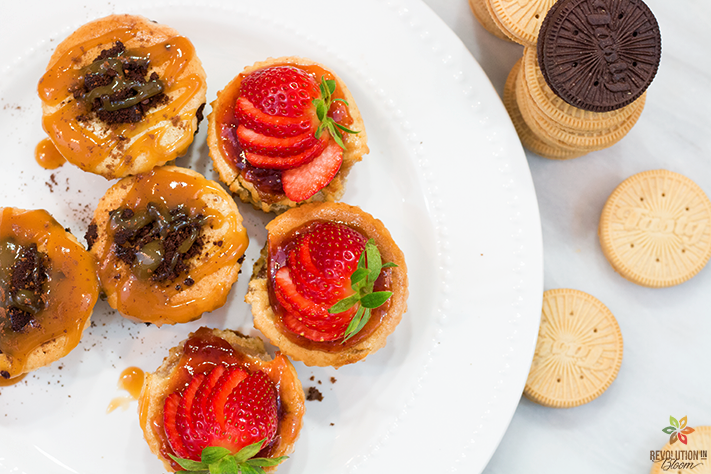 Top your chocolate cheesecake cups with extra crumbled chocolate cookies and a drizzle of salted caramel sauce. 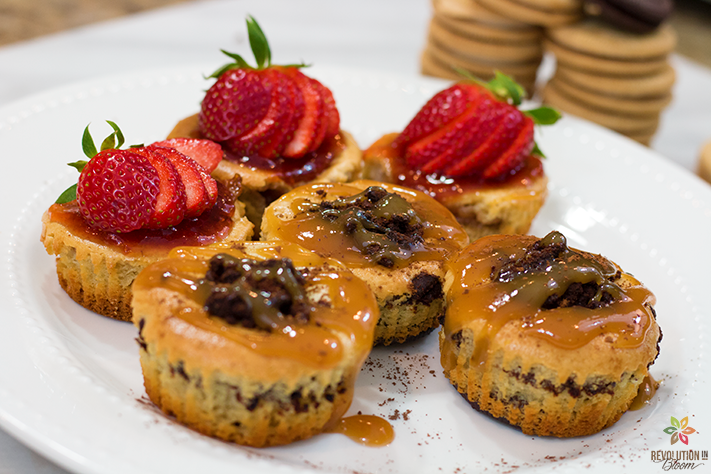 Top your strawberry cheesecake cups with a thin coating of extra strawberry preserve and a fresh strawberry. Serve immediately or leave chilling in your fridge for up to 5 days. ENJOY!